Avail from us different types of fancy buttons like thread buttons and beaded buttons that come in a wide array of attractive shapes and colors. Made from high quality rayon, polyester, glass beads, metallic yarn, cotton, chenille and other raw materials, these buttons are used as embellishment on various ladies apparels, handbags, home furnishings and fashion garments. Our collection includes yarn or thread button and beaded buttons. These fancy buttons can be custom manufactured in sizes  small or large as per the requirements of the clients. With advanced production facilities and hard working team, we can easily supply the bulk orders within stipulated time frame. We are one the leading manufacturer and supplier of Decorative Button with the high-quality of material used as per the industry standards. Size 3.5cms. H/5. 25cms OD & 3.5cms ID. 1)3.5cms. H/5. 25cms OD & 3.5cms ID. Size Tassel 3" & Loop 5". Packaging Details: Standard package according to customer's request. 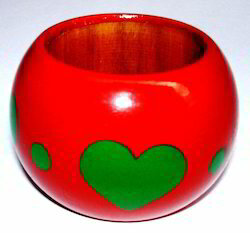 1)Size Dia 4cms. & Long 3cms. 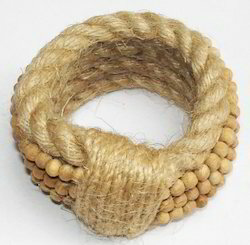 3)Material - Jute & Wood Beads. Looking for Fancy Buttons ?